Discs do not actually "slip". Rather, they may herniate or bulge outward. A herniation is a displacement of the center part or nucleolus of the disc. The Doctors of Millar Chiropractic Clinics specialize in Disc Problems including: Bulging Disc, Herniated Disc, Prolapsed Disc, Degenerative Disc, Stenosis, Spondylosis, and sciatica leg pain or arm pain often associated with disc problems. It's our bread an butter so to say. We really get disc. We like to figure out what is causing the problem and what is a red hearing (not causing the problem) and we love to treat disc problems. We utilize many techniques of Chiropractic in treating disc problems. It's not one size or adjustment fits all. In addition we use the renowned DLR Protocol with decompression, laser, and ReBuilder, long axis traction, disc pumps, flexion/distraction, blocking, lasers, therapy, rehab and exercise (at the appropriate time). We have successfully treated hundreds and hundreds of disc patients over the years, getting them out of pain and keeping them from surgery. Dr Millar practiced for years with the neurosurgeons of UAB Dept of Neruosurgery at his Decatur clinic. He has taught the Millar Chiropractic Doctors those successful techniques. So i f you Doctor says you need surgery then you must give us a try before surgery. What do you have to loose? If your Doctor says nothing he can do, then you must give us a try. Why live in pain the rest of your life? Again all you have to loose is the pain. 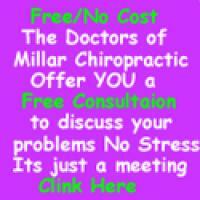 Call Millar Chiropractic Clinics Toll Free at 1-800-462-4476 and ask for the Free* Consultation/meeting to discuss your problems and our possible solutions. You may have heard the term "slipped disc" used to describe a low back injury. Discs do not actually "slip". Rather, they may herniate or bulge out from between the bones. A herniation is a displaced fragment of the center part or nucleus of the disc that is pushed through a tear in the outer layer or annulus of the disc. Pain results when irritating substances are released from this tear and also if the fragment touches or compresses a nearby nerve. Disc herniation has some similarities to degenerative disc disease and discs that herniate are often in a stage of degeneration. 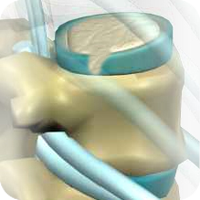 Herniated discs are more common in the low back or lumbar spine but can often occur in the neck or cervical spine. But by whatever name you call it it can be quite painful. Disc are made out of cartledge and we all know how cartledge can wear out over time. Many factors decrease the strength and resiliency of the disc and increase the risk of disc herniation. Life style choices such as smoking, lack of regular exercise, and inadequate nutrition contribute to poor disc health. Poor posture, daily wear and tear, injury or trauma, and incorrect lifting or twisting further stress the disc. If the disc is already weakened, it may herniate with a single movement or strain such as coughing or bending to pick up a pencil or picking up something too heavy. Herniated discs are most likely to affect people between the ages of 30 and 50. Disc herniations may be present without causing pain. The most common symptom will be pain in the area of the herniation that may radiate across the hips or into the buttocks. You may also experience numbness or pain radiating down your leg to the ankle or foot. If the herniation is large enough, you may notice weakness with extension of your big toe and you may be unable to walk on your toes or heels. In severe cases of lumbar disc herniation, you may experience changes in your bowel or bladder function and may have difficulty with sexual function. Mild disc herniations can usually be treated conservatively with stretching, exercise therapy and chiropractic care. More moderate to advanced cases will often require some form of spinal decompression, such as traction or mechanical decompression, in conjunction with chiropractic care. At Millar Clinics we utilize the tried and proven DLR Protocol for treating bulged and herniated disc. 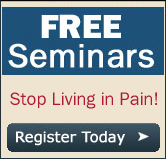 This is a gentle, effective, non-surgical way of treating many disc problems. The Doctors at Millar Clinics were among the first in the State of Alabama to offer decompression traction and the first to offer the DLR Protocol. You can read more about the DLR Protocol here. Free* All other services at regular fees. Some persons or insurances not allowed to receive free services is that is your case then this does not apply to you. Results Vary.